Mystery Number 182 – supplied by Philip Millard. I think it is Crewe South based on the shape and layout of the coaling plant. This is the north end of Crewe South Shed. 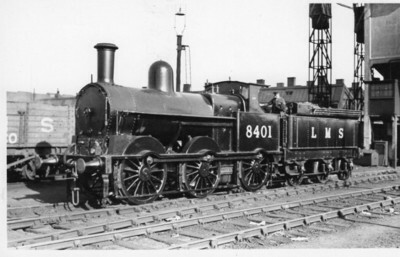 The engine, 'Cauliflower' No 2313 was built in 1896, was given a Belpaire firebox in October 1927 and was renumbered as LMS 8401 at the same time. Perhaps the photo was taken just after its emergence from the Works with these changes? It was renumbered 28401 in 1942 and scrapped in 1947. I had thought this might be one of the earliest photographs showing the new livery (with "LMS" on the tender) so perhaps taken around November 1927. But the smokebox shedplate looks like the later cast-iron type, probably with a shed number in the 1935 series. Perhaps this might be confirmed by examination of this print, or that of another photo obviously taken at the same time (in 'An Illustrated History of LMS Locomotives' by Bob Essery & David Jenkinson, vol 2, OPC 1985, plate 222. If the shedplate shows, say, "5B" for Crewe South, instead of "15S", the date of the photo would have to be 1935 to 1942, and probably pre-1940. "LMS Engine Sheds Volume 1" by Hawkins/Reeve 1987 pages 114 and 115 has two images dated around 1938 and 1936. Both show the missing glass in the shed roof in exactly the same place as the mystery photo. This suggests a date in mid/late 1930s, although it is quite possible that the roof was in that state 10 years or so earlier! !